St. Louis police shooting: 18-year-old, who authorities say was firing gun, is killed. 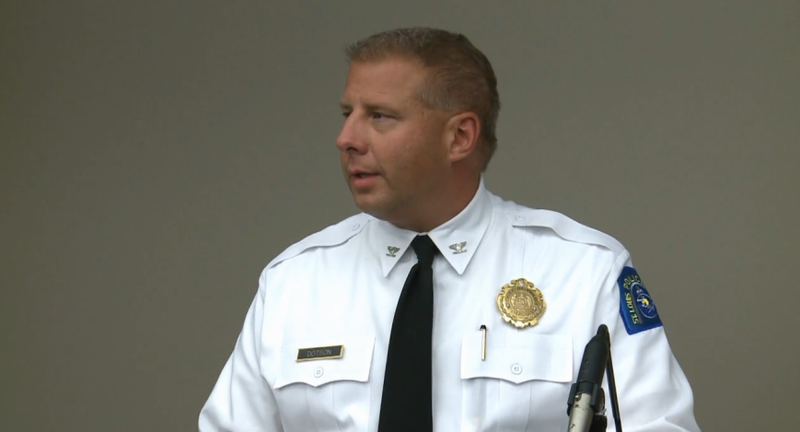 St. Louis Police Chief Sam Dotson discussing the shooting. The chief said the suspect, whom he didn’t identify, ran up a hill, turned and opened fired on the officer, who returned fire and killed the man. A 23-year-old woman identifying herself as Myers’ cousin told the St. Louis Post-Dispatch that Myers was not armed and was carrying a sandwich that the officer who killed him mistook for a gun; police say Myers was using a 9 mm that was recovered from the scene. The Post-Dispatch also reports that Myers “was scheduled to stand trial in November for unlawful use of a weapon and resisting arrest” on charges related to an incident on June 27 of this year. Wednesday night’s shooting will be investigated by St. Louis police’s newly created Force Investigative Unit, which was established after officers killed 25-year-old Kajieme Powell, who was approaching them with a knife, 10 days after the death of Michael Brown in nearby Ferguson.